Cycling is the third most popular recreational activity in the U.K with an estimated 3.1 million riding a bike each month. This is because it has a huge broad appeal and is suitable for all from the young to the elderly. It is no longer just a hobby but a way of life for most. It is a responsible mode of transport; it’s environmentally friendly and easy on your purse strings. Let’s not forget how cycling improves your health and fitness as well; it can help you lose weight, reduce stress, tone your legs, improve cardiovascular fitness and it has also been proven to improve your sleep. So why don’t more of us cycle? Well for one the British weather can be unpredictable and unforgiving the slightest hint of rain and we all cower back indoors or return to the warmth provided by our cars. Time is another huge factor in our minds it is quicker to travel by car so more can be achieved in our day. I think lastly its laziness and the mental block we put up at the thought of voluntarily doing exercise. Sometimes your body acts like a rebellious teenager and starts to ignore what the brain is telling it, your body can be stubborn and disobedient and in need of discipline. So why not try a stationary bike? You don’t have to join a gym to enjoy the perks of cycling indoors. You can enjoy a stationary exercise bike in the warmth of your own home and can use it at a time that’s convenient for you. You don’t have to worry about the weather or even if you can keep up with the rest of the class, you only have yourself to challenge. You can work at your own pace and even multi- task whilst cycling keeping yourself engaged and motivated. So whether you are a novice looking to improve your general fitness or an experienced cyclist looking to tone and strengthen more muscles, there is an indoor bike for you. The most traditional form is the upright magnetic resistance exercise bike; this is a smooth and safe bike with a small flywheel, adjustable seat and pedals to improve your comfort. You can enjoy the perks of a magnetic resistance bike whilst watching your favourite TV programmes, listening to music or even reading a book. The tension is adjustable on these bikes so you are always in control of the resistance keeping you motivated and engaged. Cycling for up to just 2.5 hours a week can improve your brain power, increase the activity within your immune cells and increase your metabolic rate. Cycling is also a low impact type of exercise making it easier on your joints than running or other high impact aerobic activities, perfect for those who cannot use a treadmill due to arthritis. 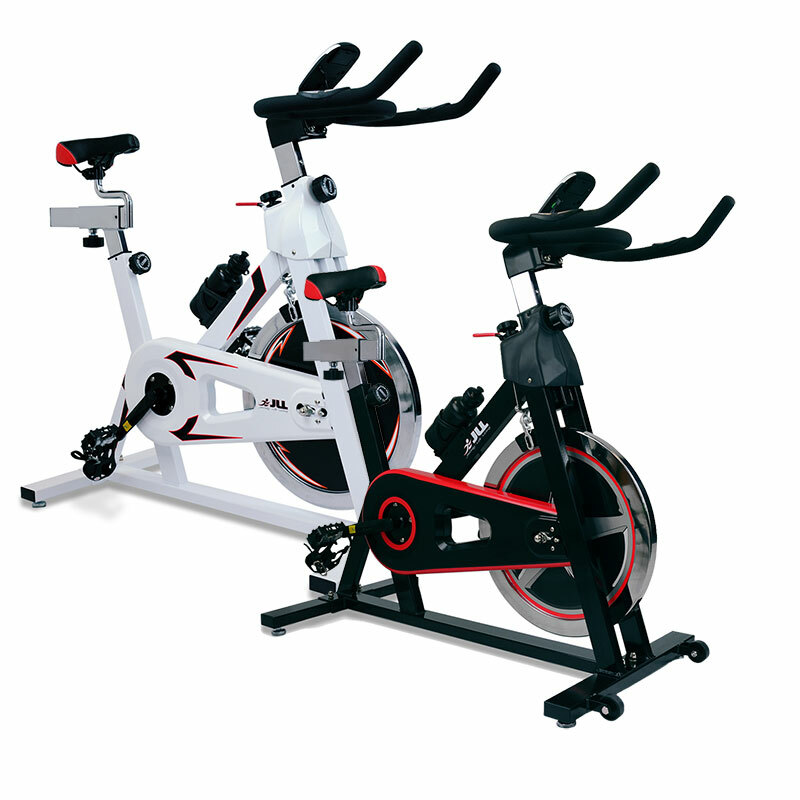 A spinning bike is another option; they were originally designed to be used in group classes with the instructor at the front of the class yelling out commands. Spin Bikes are becoming increasingly popular in the home due to their adaptability and the fact that they can simulate a real bike. They have adjustable seat and handlebars that not only allows the user to control the height but also move forward and backwards so the user can stand on the pedals and make the workout more challenging. Unlike the road however you can get an upper body rhythm going that helps your leg rhythm and the movement form a slightly bent position and side to side motion works both the central abdominal muscles and those on the side of the abdomen this is called rhythm release. Combining the use of weights to your cycling routine will give you a full body workout so you can sculpt and define the areas you want. Regular use can lower your body’s workout breaking point, increase your lung capacity, control your breathing and decrease anxiety and help lower your heart rate when physical exertion begins to take your breath away. Cycling can also be used as a catharsis for retaining pent up emotions this combined with the endorphins released when doing exercise will make any user more content and generally happier in their day to day life. So who wouldn’t want an exercise bike? They are compact, easy to use and extremely affordable. Choosing to have a stationary bike in your home is not a difficult decision to make it’s just a matter of which bike fits your needs better and once you have chosen your model you will be well on your way to improving your health and fitness. Next story How Much Sodium Should You Eat? Previous story Choosing the right piece of Home Fitness Equipment for your Physical therapy needs.